Looking for: A Service Garage Near Me? Have you been spending time running from auto shop to parts store to auto shop, trying to get your vehicle fixed or maintained? Are you tired of the time and money drain? Are you looking for a garage near by your college or work in Downtown Grand Rapids? Frustrated because your vehicle isn't running right? 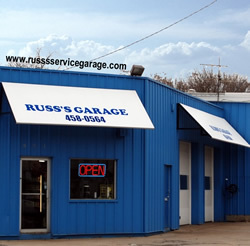 Stop by Russ's Garage in GR. Grand Rapids service garage customers have been choosing us since 1928! We have been serving the folks around the Great Grand Rapids area for over 85 years. You can choose us with confidence. We provide knowledgeable, customized diagnosis and repair of all makes and models, foreign and domestic including up to date Diagnostic Scanners and Scan Services. $40 basic scan. $80 diagnostic scan.